Youngsters to hit the high ropes! 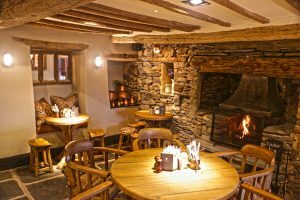 It took more than 1,000 days and cost over £2 million, but the lengthy and extensive refurbishment of one of the Lake District’s most iconic hostelries was well worth the wait. 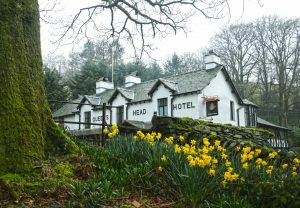 The Grade II listed Queen’s Head Hotel in Troutbeck, which suffered a calamitous blaze in June 2014, re-opened to the public on March 29th. 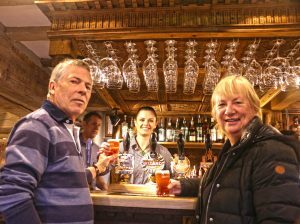 Robinsons Brewery operations manager Simon Taylor, who said the red tape delays that had seemed to drag on forever had actually worked in favour of the restoration. The residential accommodation was largely destroyed in the blaze, and it is here that the most extensive renovation has been carried out; all ten en suite bedrooms has been completely redesigned and are named after 10 of the 11 highest fells: Scafell Pike, Helvellyn, Skiddaw, Great End, Bowfell, Great Gable, Pillar, Nethermost Pike, Catstycam and Esk Pike. 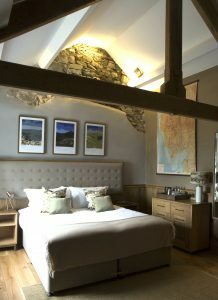 “We left out Scafell (the second-highest fell) so guests didn’t confuse which bedroom they were staying in!” said Simon. Outside, two new roof terraces have been added, offering fantastic views of the iconic Ill Bell range, and there are new seating areas by the front entrance. Not all the hotel’s features were destroyed in the blaze, which drew five fire crews to the scene. 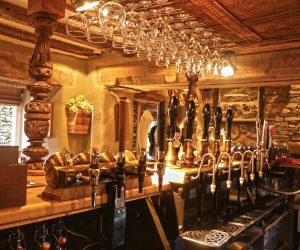 The famous Four-Poster Bar, constructed from an Elizabethan four-poster bed which originated from Appleby Castle, survived and has been given a facelift. The bar uses several different pieces of antique furniture. An inscription ‘1714’ can be seen, and parts of the frame are rumoured to be as early as the 17th century. Robinsons’ range of beers is more modern, and eagle-eyed ale fans will find something new in the form of specially brewed ‘Patterd’Ale’. On the pump is a painting of pub manager Samantha Robinson’s pet dog Milly. There are currently 12 full-time staff at the hotel, but more people are needed for kitchen work and front-of-house. If you are interested, drop in and chat with Samantha or call her on 015394-32404.